More Montessori baby goodness. Looking at these little babies with their mobiles brings me much joy. These are gorgeous! These photographs are from Elsa and her son Finley. Above Finley is enjoying his homemade Munari mobile at 9 days old. Finley aged 1 month intently watching a felt black and white mobile. Elsa designed and made this mobile using the Montessori metal insets as templates - what a fabulous idea! Elsa said this was his favourite mobile ever, even at 3 months he was still enjoying it over all others. This is Finley's movement area. At 5 months Finley is working hard on improving his motor skills and does not watch mobiles very often. Elsa used music CDs storage cubes around his mat to put away his books and toys and only ever put one toy in one cube, as in "a place for each thing and each thing in its space". It looks ordered and provides the one-to-one correspondence which is so important for young children. To hang his mobiles Elsa attached a hook at the end of a fishing thread which passed through a ring attached to the ceiling. The thread then came back down at arms' reach where there is little device that is used to pull the mobiles up or down. It's very handy as not all mobiles are the same length and therefore need to be hung at different heights! Elsa and I both experienced a breakage with the Munari, the globe is fragile and needs to be treated with care. This is Margaret in her movement area with the Munari mobile. Margaret has also recently used the Octahedron. You can read more at Sally's blog Butterfly. This is Miles finding himself in the mirror, aged 3 weeks. Miles and his family reside in Australia. It's so nice to feature Australian families here. Miles with the Dancers Mobile. His mum Jackie says "The Dancer Mobile has been a bit hit with Little Miles - he is transfixed by them! I can leave him under this mobile for almost 2 hours, and he will concentrate on them for the whole time!! That's a massive bonus for his concentration span." I love his wriggling arms and his focus! You know this is the Gobbi mobile. From Jackie, "Here is our little guy, exhausted by mobile - time for sleep! Sometimes I find having the mirror seems to be too much for Little Miles to take in as well as the mobile. So I simply take away the mirror so he can solely concentrate on the mobile. Seems to work for us!". Jackie made this mobile herself. A tactile mobile with a ring and bells. It's lovely to see the progression. "My first daughter Alice was born three and a half months ago and I came across Montessori mobiles whilst looking for inspiration online. 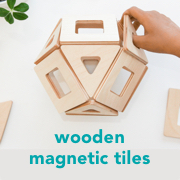 We don't really follow Montessori, but I like a lot of the thoughts and ideas behind it, and we are planning on introducing more elements into Alice's room as she gets older." "Alice Octahedrons: This mobile hangs over the changing table. I used different coloured card and also shiny black and gold mirror foil. For contrast I used a branch from our garden to suspend them from." "Alice Bell and Ring: This is the most simple mobile - just two hooks in the ceiling. One ribbon has a bell tied to it, and the other one an ivory teething ring, which has been handed through the generations down from my grandfather!" "Alice Butterflies: This was the first mobile I made for my daughter. It was inspired by the black and white animal pictures and features five Butterflies. In this picture Alice is two months old, and I love the concentration on her face!" I love everything about this picture - beautiful Alice, her bassinet, her blanket, the flowing curtains in the background. Simpy stunning. I still have a few more photographs to feature and will post these in the next couple of days. 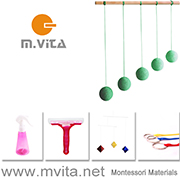 I hope these contributions have given you some inspiration, ideas or simply insight into how other families have used the concept of the Montessori mobile. Thank you again to the generous families who have shared these images with us.